There has been a lot of debate over the role Virtual Reality technology will play in the future of gaming. According to a recent report from Digi-Capital, the next ten years will see the VR market grow to a $150 billion industry. Online casinos are definitely tempted to get a piece of this potentially lucrative pie. If Virtual Reality does for online casinos what online casinos did for land based casinos, we could well have a revolution on our hands. At the moment however, the average person is still looking for more affordable hardware and more engaging content. Development has been quite slow with regards to VR gaming which is understandable as it presents a completely new paradigm for software developers. Microgaming and NetEnt are two companies that have thrown their hat in the ring and recently showcased some of their VR games at the ICE Gaming conference. Microgaming has been working on the CRYO Lab software platform due to its easy integration with the commercially available Oculus Rift VR headset. NetEnt wowed crowds with a VR conversion of their most popular slot, Gonzo’s Quest. That said, the online site that offers the virtual casino world that most people are expecting is SlotsMillions. Here you can play 40 original slot games in a virtual high rise building with 80 floors. It may sound interesting but half of the game entails entering the building and riding the elevator. A Swiss company called Mega Particle has developed Casino VR Poker and it does what it says on the box. Players can enter a virtual poker room and sit down at a multiplayer table all in real time and with real human players represented by virtual avatars. There are big things ahead potentially for the VR industry but we are yet to see wide scale mainstream adoption. At the moment most people see VR as something that they will buy their kids or a novelty toy for adults. There is yet to be that zeitgeist moment where people see software that fully reveals the value this new tech can have and how beneficial a sense of immersion can be for the players of an online casino. For now online casinos and land based casinos in Canada can retain their thrones at the top of the iGaming hill, but pretty soon we may see a new challenger to the crown. 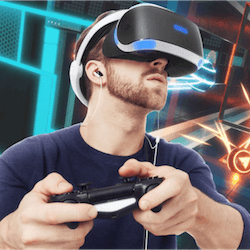 VR gaming could bring in a whole new dynamic of not just quality games but a quality aesthetic since you now would need to create a virtual world for your casino members instead of just focussing on quality game play. Whatever the future holds, it will be the players that benefit the most.